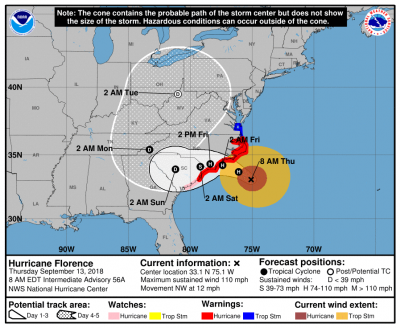 Based on the 8 am forecast model from the National Hurricane Center, Hurricane Florence has downgraded to an intense Category 2 hurricane with maximum sustained winds of 110 mph. Although the storm has slightly weakened, it is still a very powerful hurricane that forecasters are labeling as a "life threatening" storm. Hurricane Florence is expected to make landfall Friday near the SC/NC border and then shift towards SC where it is expected to stall for two days over SC. The storm will bring significant wind damage to our area and historic levels rainfall and flooding. Tropical force winds are expected to arrive in our area early this afternoon. Banks and other local businesses have already closed for the day, or will be closing around noon. City officials are recommending motorists stay off the roadways starting late this afternoon, and they are encouraging residents to start hunkering down for the approaching storm. Accordingly, we will move up today's closing from 4 pm to 2 pm in order to give our customers and employees ample time to get home and prepare for the storm. We apologize for the change in today's schedule. All schedules will be processed as normal today. In order to ensure proper funding today, we are encouraging clients to submit their schedules to us as early as possible. Please note that we will be closed on Friday as the Hurricane Florence makes landfall. All decisions on next week's schedule changes, potential delays, and other measures will be made once we properly assess the storm's damage and our power situation. Please refer to our Online Account Portal, social media sites and other normal communication channels for continued updates.